Downtown, NEW YORK—After nearly three decades on the East River, the Pier 17 mall at South Street Seaport in Lower Manhattan will be demolished this October beginning a multi-million-dollar renovation of the pier according to the New York Daily News. The aging red mall has been an iconic structure in the South Street Seaport District, but it has not fared as well financially as some had hoped. Its tourist shops and small family-owned stores and restaurants remained a top tourist destination, although a number of restaurants were never able to reopen after Hurricane Sandy. Developers hope that the new pier mall can bring life to the struggling area. Pier 17 is not the only abandoned part of South Street Seaport. With the damaging long-term effects of Hurricane Sandy, the area’s restaurants and shops are still recovering from the flooding and damage the storm brought. Almost every street has a boarded-up storefront with promises to reopen soon. Although it has been almost a year since the storm hit, the jewelry store, Local Charm, has a sidewalk sign that reads “RE-OPENED after Hurricane Sandy!” The store’s manager confirmed the shop's reopening, which took place June 2. All tenants of Pier 17 were forced to finally close their doors Sept. 9, but not all went down without a fight. Many feared that their small shops would not be invited to return to the new mall. Since the mall’s official closure, it has sat abandoned. A security guard is posted outside its entrance, repeatedly answering swarms of tourist’s questions about the state of Pier 17. 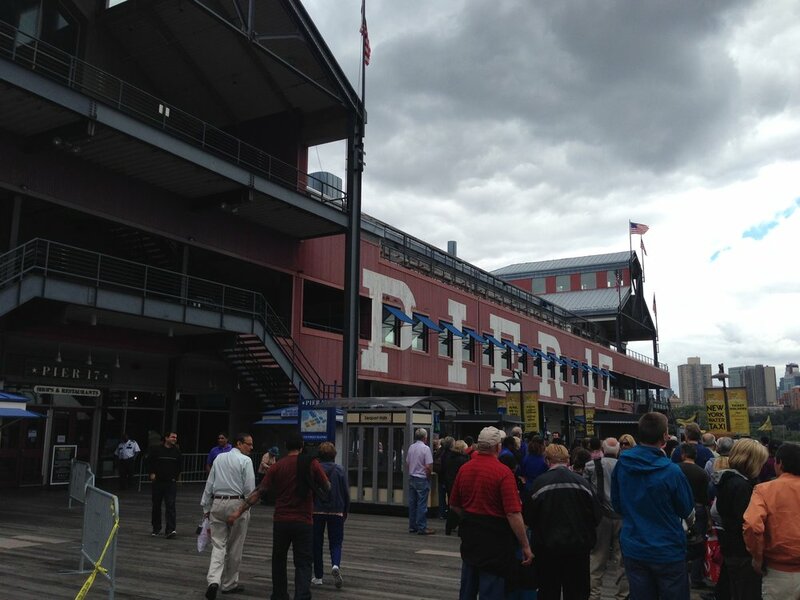 Jack Putnam, who has worked at the South Street Seaport Museum since 1981 and has been the museum’s historian for the past seven years, laments the changes to Pier 17. “I saw that built. And now I’m going to see it unbuilt,” he said. Putnam doesn’t see the proposed glass-structure, and potential high-rise hotel, fitting into the historic setting that South Street Seaport has for so long tried to preserve. Most of the buildings that surround Pier 17 are low-rise and colonial, lining cobblestone streets so Putnam claims that adding a 46-story tower to the neighborhood “from standpoint of historic preservation” simply doesn’t make sense. Still, he said he sees how the changes at Pier 17 could draw more people to the area, including the museum.